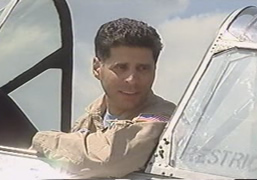 Larry Arken, residing in Hicksville, N.Y., is a Captain with American Airlines and has been flying since he was a child sitting in the co-pilot seat behind his father, Mort. Larry is a New York native, has a bachelor's degree in marketing from Queens College and a bachelor's degree in business from Edison State University. He started his career flying warbirds and corporate jets while growing up. Flying Falcon 10's, 20's and 50's, he later flew DC-8's for UPS before flying with American. The consummate aviator, he presently flies a P-47, F4U and P-51 for the Air Power Museum in Farmingdale, NY. Larry also holds a NATA designation as a formation check pilot. I had an interest in aviation from an early age. My father worked for NASA in Newport News, VA. as an aeronautical engineer, and introduced me to flight in 1973. After attending William and Mary College for two years, I transferred to Embry Riddle Aeronautical University in Florida to earn my degree while accumulating flight time and ratings. Graduating in 1980, I went to work at Kennedy Space Center as a Calibration Engineer, flying charters and flight instructing on the side. In 1982, I was accepted into the USAF, earned my wings, flew F-16 fighters for five years, and instructed in T-37s for three more. Presently a copilot on the B777 for a major airline, I continue to fly general aviation as much as I can. 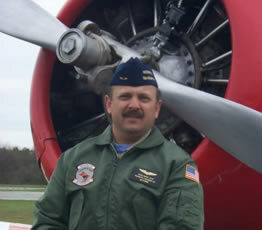 I am a NATA formation Lead Pilot and instructor, as well as the unoffical publications, standardization, and operations procedures writer for the Skytypers. 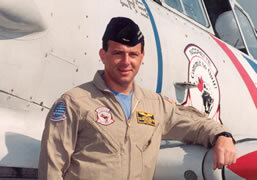 The Skytypers have flown with me since 1995, and I consider it an honor to call all the pilots and mechanics my friends! An early interest in aviation led Bob to flying lessons at age 17 using 65 hp. Aeronca "Champs" out of a grass strip near Detroit. He got his private license in 1958 and flew as much as he could afford through college. Being subject to the draft and unable to get a real job until his military obligation was satisfied, he decided to "Fly Navy" for five years, gaining multiengine, instrument, and carrier experience. Shipboard duty was interesting, but a Navy career doesn't really provide a long flying span, so he moved on to airline flying in 1966. In 1977, a friend introduced Bob to the Skytypers, flying Navy SNJ2 trainers out of Flushing Airport, a small airstrip next to LGA. Thus began a new career with Mort and Larry Arken, doing aerial advertising and airshows. The camaraderie and professionalism associated with the group as well as the pleasure of operating these "taildragging" workhorses of the WWII era with their 600 hp. "round" engines keeps the older guys young. -Marketing professional with 20+ years of success. 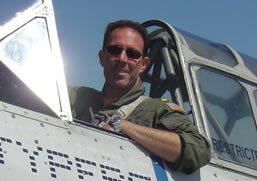 -Aviation credentials include Com, CFI, NATA formation card, airshow performer. -Association affiliations include AOPA, EAA, NATA, & Tailhook Assoc." Tom grew up on the south shore of Long Island, New York where he went on his first airplane ride at eight years old. He took his first flying lesson at Zahns Airport in 1967. He received his Bachelors Degree from Dowling College's first official Aeronautics class of 1971 and his Masters Degree from CW Post College in Criminal Justice. After college he became a special education teacher at the elementary level in Nassau County. In pursuit of his aviation goals Tom joined the Nassau County Police Department and has flown a police helicopter for over thirty years. His rescue and police related efforts have earned him awards for heroism from Helicopter Association International, Aviation and Space Writer's Association, and the FAA. He has also received two Congressional awards. A graduate of Manhattan College, and a former Air Force jet pilot, Rob has seen the world a couple of times over, with more hours logged than he cares to admit. As a captain for a major airline he flies with the Skytypers on the weekends to hang out with the guys, keep his skills sharp, and have more fun than most people dream of. Rob is a Brooklyn native, loves "typing" over his old stomping grounds, and still can remember the "COPPERTONE" ad the Skytypers did 30 years ago. How's that for a lasting impression! "I still can't believe I actually fly with these guys!" Ken Johansen first flew with the Skytypers as an eight year old. He'd already caught the aviation bug from his father, Skytyping Instructor Pilot Bob Johansen, and this flight sealed his fate. 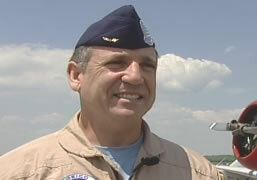 Ken graduated from the US Naval Academy in 1989 and earned his Navy Wings in 1991. He went on to fly P3's on both coasts with VP23 and VP46. 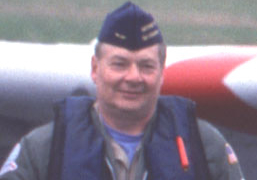 His career took him to the Netherlands where he flew P3's with the Royal Netherlands Navy from 1996 to 1998. 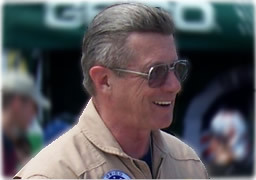 Ken left the active duty Navy and was hired by TWA where he flew MD80's, B757's and B767's, he was also hired by VR52 in Willow Grove Pennsylvania as a Navy Reserve Pilot flying DC9's around the world. Ken enjoys flying Aeronca Champs, Citabrias and Stearmans out of a small grass strip in Northern Pennsylvania with his two sons. "Flying with the Skytypers has brought my flying career full circle and I consider being a part of this group of professionals an honor and a privilege"
radial engines courtesy of the Navy T-28 ‘Trojan’ and S-2 ‘COD’ . That affection continues today with the Skytyper SNJ’s. After leaving the Navy, Jim flew corporate before joining the wonderful world of Airline flying. 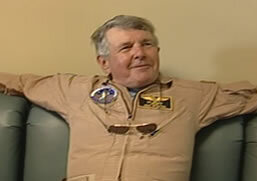 He flew the Douglas DC-9, Boeing 757, 747-400 and Airbus A-330 worldwide before recently retiring from a major airline. He now splits his flying time between WW1fighters, antique biplanes and Skytyping. “Flying with Mort, Larry and my fellow Skytypers is about as good as it gets in civil aviation.